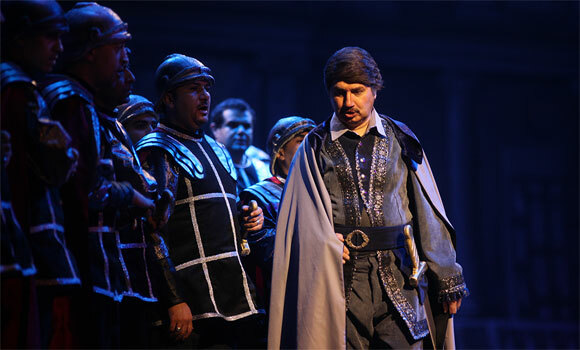 Composed to a libretto by Salvadore Cammarano, and based on Antonio Garcia Gutierrez’s 1836 play El Trovador, Il Trovatore is widely seen as Verdi’s masterpiece. Captivating music, melodious arias, duets and choir are among the highlights that for over 160 years have attracted opera lovers and critics alike. Set against the backdrop of 15th-century Spanish politics, the libretto is filled with passion, love and revenge; it is full of mysteries, with parts of the story taking place behind the scenes. Contrary to what the title suggests, the action does not centre on the troubadour but on Azucena, the old, pained Gypsy woman whose tragic experiences of the past bring together the dramatic threads and characters. The opera was extremely well received by the audience when it premiered in 1853, and though it has continuously been a favourite of audiences since then, critics all through history have managed to pick on some aspect of it or another – never mind that their arguments have seldom proved convincing. Early critics were troubled by the sinister musical material accompanying an already violent storyline, or they praised the music but found fault with Verdi stressing the darker shades of the voices. More recent critics have questioned the plot itself, calling it highly implausible. Yet, complex as it remains, a deeper reading of the text reveals a serious attempt at reaching down into the innermost core of human tragedy, and events that make much better sense than most comic libretti of the time. Despite the criticism, for opera lovers Il Trovatore remains a magnificent experience, no less for its great arias and matchless music than for the way that music conveys the darkness of the story, providing unforgettable aesthetic values in the process. The real difficulty of the opera however remains in its actual production. Consisting of four acts, Il Trovatore includes numerous scenes, each taking place at a different location. The opera also requires a huge cast, from Count di Luna’s army to groups of gypsies. The biggest challenge however lies in finding, for the four main characters, what the late Italian conductor Arturo Toscanini called the “four most beautiful voices in the world” (some sources attribute this claim to the late Italian tenor Enrico Caruso). In Il Trovatore, Verdi interweaves elements of bel canto with romantic darkness, making the material particularly demanding on the singers who must manoeuvre their way through trills, long legatos and powerful drama. Due to these critical and extremely tough requirements, not every opera company chooses to stage Il Trovatore. The mere fact that the Cairo Opera Company decided to perform Verdi’s masterpiece deserves applause. Though, of Verdi’s works, Aida is the recurrent performance in Egypt, often staged more than once in a season, Il Trovatore had not been approached since 1988 – during the first season of the newly built Cairo Opera House building in Zamalek. It was then staged by a foreign orchestra and choir with of soloists from Sofia, Bulgaria. Thus the opera not only returns after a very long hiatus, it also relies to a much larger extent on Egyptian artists. 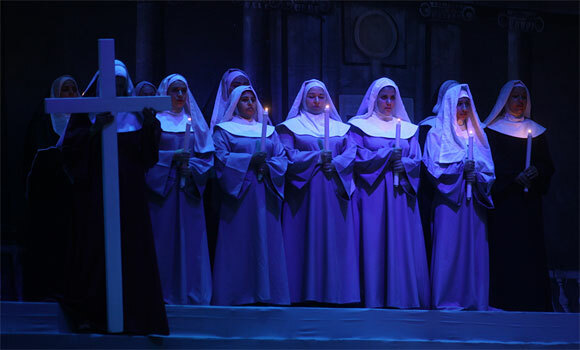 On 14 May, the curtain opened to the performance by soloists from the Cairo Opera Company and guest singers, with the Cairo Opera Orchestra and the Cairo Opera Choir conducted by David Crescenzi. 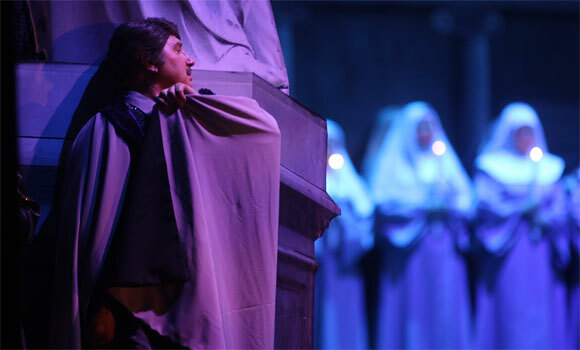 Performed on four consecutive evenings with two casts of soloists, the opera was directed by Hisham El-Tally, with set and costume designs by Mohamed Abdel Razik. And even if there were imperfections, the overall effort, integrity and the sheer artistic sincerity poured into the opera makes it an important and commendable production. With all the requirements that Il Trovatore demands of a production company, it was anyone’s guess what formula the director would use to bring to the audience the unparalleled power of this iconic work. El-Tally seemed to follow the advice of the late Italian conductor Claudio Abbado, who noted that the great operas do not need help; all they need is not to be interefered with. El-Tally followed the dramatic lines, creating powerful static images while he emphasises the music. The work was embedded in the impressive scenography and great lighting that characterise the director’s work. El-Tally is well-known on Egypt’s opera scene for a number of works in which he create a fresh and vibrant mise-en-scene, bubbling with energy, one example of which was his take on Mozart’s Magic Flute. In Il Trovatore, however, he makes far more room for visuals, allowing representations of the late Middle Ages to complement the richness of Verdi’s music. The director followed Verdi’s clear division of the work into four acts, inserting a short break between them, which is not necessarily the standard practise: some companies choose to fuse some acts. This being a sumptuous and long work, nonetheless, the procedure ensured that listeners not as well acquainted with Verdi could absorb the opera’s beauty in appropriate dosages. Moving from Count di Luna’s castle to the gardens, the convent to the forges where the gypsies work, or the foot of a mountain to the battlefield, the visual aesthetic is among the fundamental factors behind the Cairo Il Trovatore’s success. With a number of notable, signpost scenes, El-Tally intelligently juggled a large number of artists and group scenes while maintaining a simple road map for the soloists’ movement. Opera, he reminds us, is not just music. It is theatre. And this production did not lack for a fulfilling theatrical experience enveloped in the magnificent music. Two out of the four evenings cast guest soloists singing alongside the Egyptian stars of the Cairo Opera Company. For their part soprano Dragana Radakovic (Leonora), mezzo-soprano El-Shaboury (Azucena), tenor Ragaa El-Din Ahmed (Manrico), baritone Valentino Salvini (Count di Luna) and bass Frano Lufi (Ferrando) demonstrated the sparkling range of their vocal prowess, technique and theatrical skill, some excelling in all three. Whether in the solos, duos or trios, the Serbian soprano Radakovic, with her brilliant vocal abilities and strong presence established herself as the star of the evening. Her perfectly managed sensual voice translated Leonora into a strong, determined and at the same time charming woman. Radakovic was complemented well by the Egyptian tenor Ragaa El-Din Ahmed, who displayed a warm, strong timbre and melodious phrasing. His technical abilities allowed him to rise to the high C, a very difficult note to hold for a tenor, but a note that audiences will always be waiting for at the end of Act III, when he sings All’armi’ (To arms) in the cabaletta “Di quella pira” (Of that dark scaffold). El-Shaboury too infused the role of Azucena with a robust dramatic interpretation, an approach that allowed her to bring out the many layers of the troubled protagonist. Love, jealousy and revenge: Il Trovatore is an intricate 15th-century story told through 19th-century convention. Its combination of inimitable music and theatrical verve is what has drawn audiences to it. Yet in the Egyptian context, it carries even deeper values. With the Cairo Opera Company falling into the trap of a repetitive repertoire for many years, Verdi’s masterpiece comes as a much needed refreshment and sends an important message that the company is able to reinvent itself and address such challenging work to exacting artistic standards. In the hands of El-Tally, Il Trovatore is an opportunity to bring to light the many values that opera professionals are able to deliver on both the level of music and theatre. The opera also affords a platform for a rich and crucial reassessment of artistic capabilities – which are many – highlighting the priorities that the company might consider when planning the future season’s repertoire and which will hopefully include more operas seldom or never performed in Egypt. What we can also hope for is that while opening the doors to further refreshing productions, Il Trovatore’s success will also encourage a continuity needed for developing and perfecting the performance.